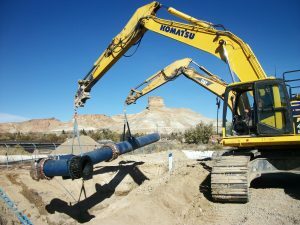 Nelson Engineering has designed and is overseeing the construction of a new 3-mile long, 30-inch diameter steel waterline to bring water to Rock Springs, Wyoming – from the treatment plant in Green River Wyoming. The new pipeline will provide critically important redundancy to the water supply for this city of 24,000 people. completed without a problem, and the existing pipeline returned to operation with plenty of water remaining in the tanks serving Rock Springs residents, whose service remained unaffected. When construction of this new 30 inch diameter pipeline is complete, Rock Springs will be served by two water transmission pipelines instead of just one, ensuring that water can reliably reach Rock Springs for decades to come.